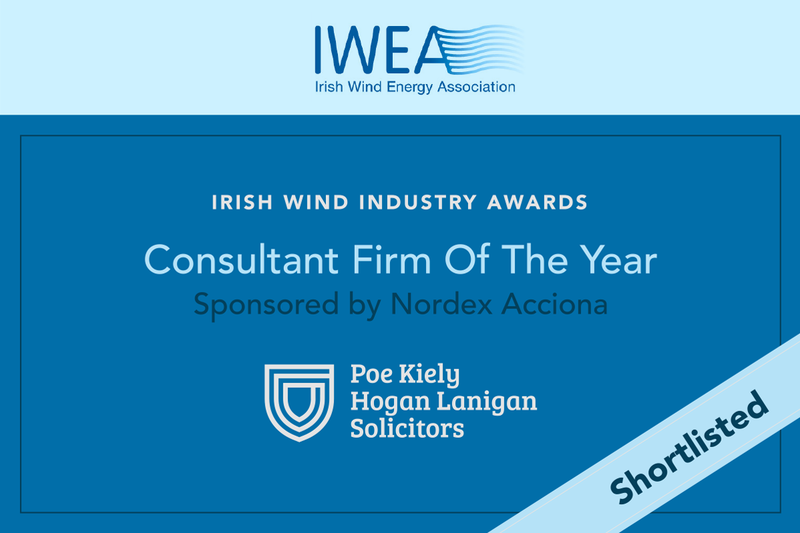 Poe Kiely Hogan Lanigan is delighted to announce that it has been shortlisted for the "Consultant Firm of the Year" category at the prestigious Irish Wind Industry Awards 2019. "Having worked in the Irish Renewables and Wind Energy market for many years, we understand the important contribution the industry makes to the local economy along with its efforts to reduce carbon emissions and help Ireland to meet its climate change obligations." said Brian Kiely, Managing Partner, Poe Kiely Hogan Lanigan, "As a modern and progressive law firm based in Kilkenny and delivering renewable energy legal advice across the length and breadth of the country, we are very pleased to play our part and to have our capabilities recognised in this way." The winners will be announced at a gala dinner and ceremony on 25 January at Clontarf Castle Hotel, Clontarf. To find out more about the Awards and to see a full list of finalists, please visit Irish Wind Industry Awards 2019.